What is DA Form 2404? DA Form 2404, Equipment Inspection and Maintenance Worksheet is a U.S. Army form used for recording and controlling the inspection and maintenance of equipment. The most recent edition of the form - often mistaken for the DD Form 2404 - was issued by the Department of the Army (DA) in April 1979. 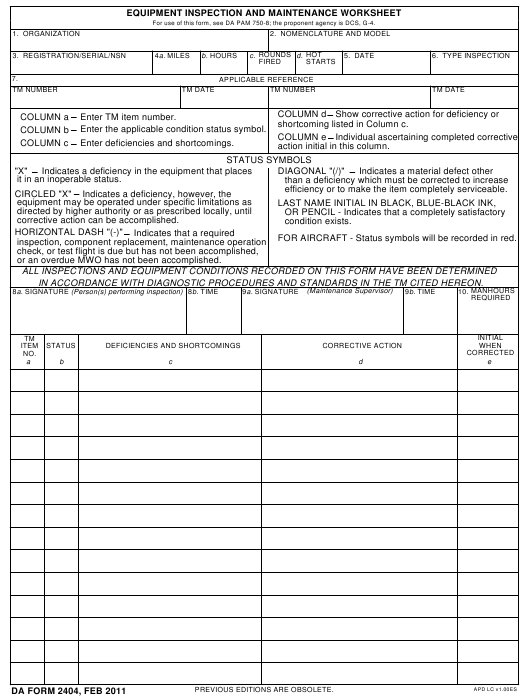 A fillable blank DA form 2404 is available for digital filing and download below or can be obtained through the Army Publishing Directorate Website. What is the DA Form 2404 Used for? The DA 2404 is used to record any inspections carried out on equipment that is in possession of the Armed Forces. This form is primarily used together with a corresponding technical manual for the particular part of the equipment that is being inspected or worked on. DA Form 2404 instructions and a step-by-step overview of the form can be found below. How To Fill Out A Da Form 2404? shortcoming listed in Column c.
Enter the applicable condition status symbol. action initial in this column. it in an inoperable status. efficiency or to make the item completely serviceable. corrective action can be accomplished. FOR AIRCRAFT - Status symbols will be recorded in red. or an overdue MWO has not been accomplished. IN ACCORDANCE WITH DIAGNOSTIC PROCEDURES AND STANDARDS IN THE TM CITED HEREON. First, identify the organization working on a piece of equipment in Box 1. Boxes 2 through 6 are used for providing identifying details of the equipment that is being worked on. Make sure you don’t forget to provide the nomenclature and model of the chosen piece of equipment. Add operation information applicable to the chosen equipment: miles, hours, hot starts and other measuring criteria. Box 7 is used for listing all technical manuals that are being used. When using more than two manuals, provide identifying information on an additional copy of the form and attach it to your worksheet. The service member responsible for maintaining or inspecting the equipment must certify the document with their signature and add a correct date in Boxes 8 and 9 together with a maintenance supervisor. The amount of service time required has to be listed in Box 10. The rest of the space given on the form is used for listing and identifying the inspected items in the maintenance records. Every item number and status has to be identified individually in Columns A and B. Any equipment problems have to be listed in Column C, Deficiencies and Shortcomings. The necessary correcting actions for improving the item have to be listed in Column D. Column E is used for signing off every piece of equipment with the initials of the maintenance personnel. After the form is fully filled, the records are to be kept with the equipment in case of a need for further reference in other maintenance operations. The maintenance group should also save a copy of the DA 2404 form to maintain an active record of all completed inspections performed on the equipment.